Parti Pribumi Bersatu Malaysia (PPBM) held a fun raising dinner at River Front Hotel Ipoh on 2nd Feb 2018. 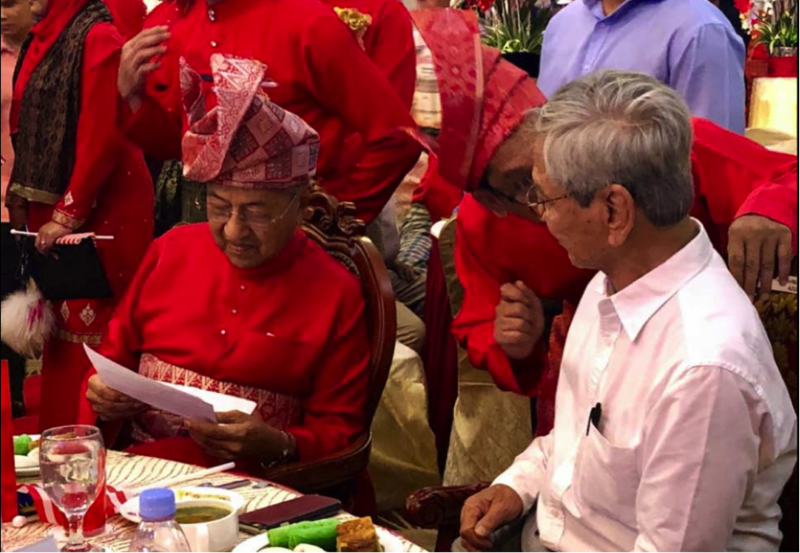 The photo shows that Dr Mahathir is reading my proposal. I come here tonight to help Dr Mahathir win Perak in the coming general election. Under the BN Government, Perak is the second poorest state next to Kelantan as stated in the 11th Malaysian Plan. Perak also suffered the worst brain drain crisis as reported in last year’s National Migration report. The present State Government only takes care of its cronies. Perakians are having great difficulties in finding jobs. The only way forward is to vote out the corrupt BN Government. In the last general election, Pakatan Harapan won 55% votes and yet could not control the state. The BN won control because of gerrymandering in the election. There are 59 state seats in Perak. In the last general election Pakatan Harapan won 28 seats and in the GE before the last one, Pakatan Harapan won 31 seats but 3 elected members were bought over by the BN government. As a result, Pakatan Harapan control. Based on the last GE record, Pakatan Harapan won control of Kedah, Penang and Selangor. I suggest Dr Mahathir to stand in one of the 13 seats allotted to PPBM to ensure winning Perak. I wish to donate Rm 200,000 which is to be used in Perak to ensure winning control of Perak.